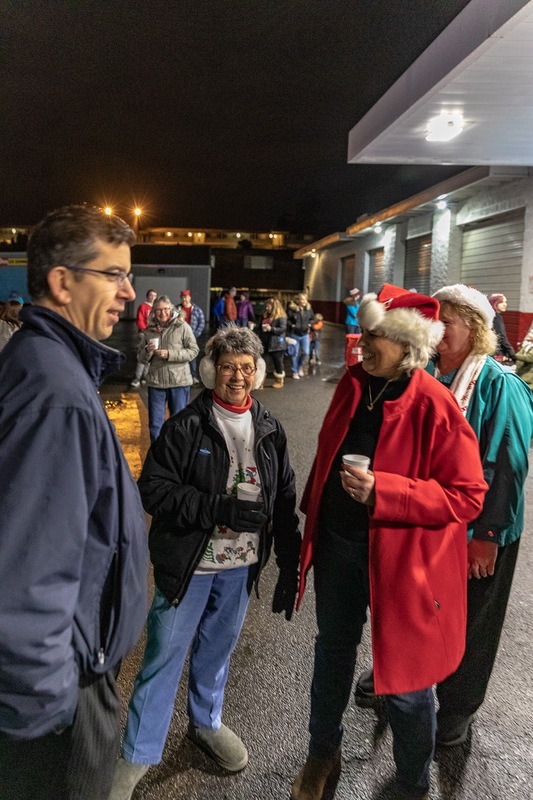 The weather was perfect for Santa to visit the North City Business District for the 21st Annual Tree lighting event on Saturday, December 1, 2018 at Les Schwab tire on 15th NE in the North City Business District. 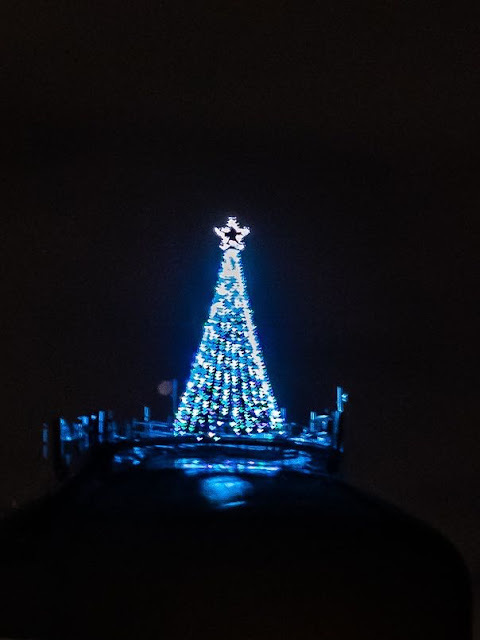 The lighting of the tree on top of the North City Water District’s reservoir started in 1997 when the wireless carriers built a platform on the top of the tank for the District. The lights on the tree can be seen for quite a distance along I-5 corridor. 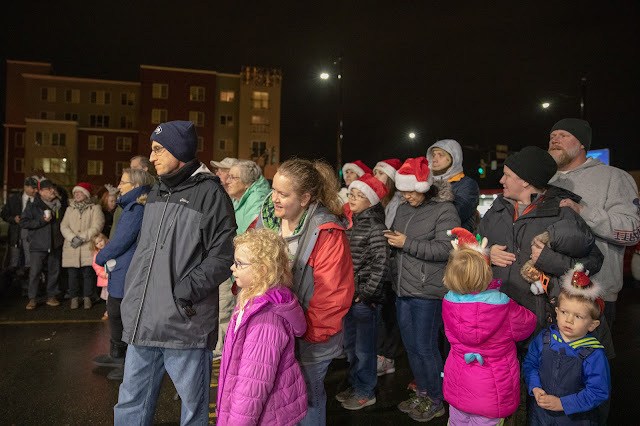 The evening started off with the Around the Sound Band playing carols and the audience singing along at the Les Schwab dealership. 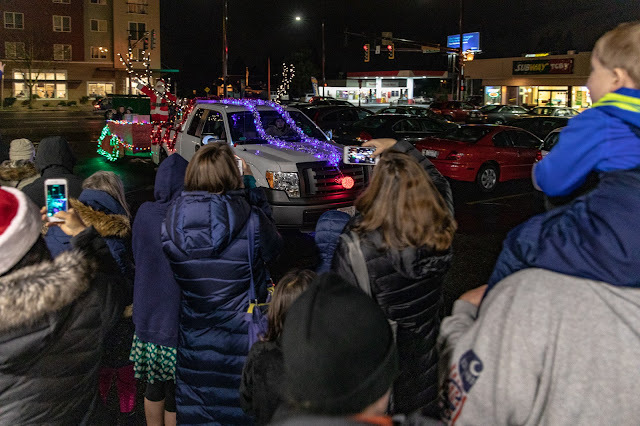 Once the band started playing Up on the Housetop, Santa rode in on his sleigh pulled by a giant reindeer (with the help of the Water District staff) with his elves. 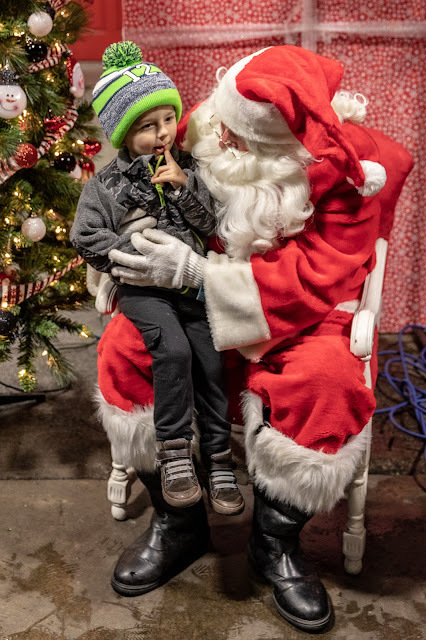 Santa spoke to the crowd, who helped him countdown until he flipped this giant “light switch” and tree on top of the reservoir burst on with lights. Over 250 youth and a few four legged creatures waited patiently in line to sit on santa’s lap and receive a candy cane and toy from some of Santa’s elves. Walgreen’s took photos, which are available at the North City store. FM 100.3, Sacred Heart Radio Station, provided the sound system and was a great addition to the event. The City of Shoreline helped decorate the neighborhood by putting up the holiday banners. Coffee, hot chocolate and cookies were donated by many long time volunteers, including Charlotte Haines, the original lead of the North City Neighborhood Association and current Water District Commissioner. Charlotte continues to give back to the community she has played a part in forming for over 50 years. It was truly a great place to be on Saturday night.